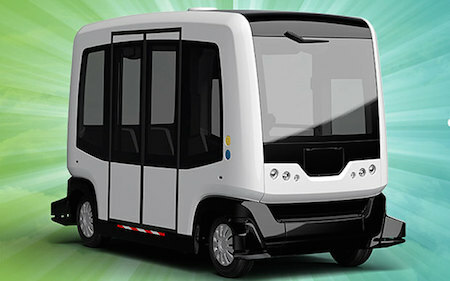 A driverless - or self-driving - electric shuttle for use on public roads will go into regular use between the two towns of Wageningen and Ede in the province of Gelderland starting in November. The WEpods will drive on regular roads with other traffic, and are not using special lanes. During its test phase it will not travel in challenging conditions, such as in rush hour traffic, at night or in bad weather. A control room will monitor the vehicle and safety of its passengers. The six-person vehicle has a maximum speed of 25 kilometres per hour. The WEpod team intend to equip the vehicle with additional technical equipment such as cameras, radar, laser and GPS to track the environment the vehicle will travel in. According to Joris Ijsselmuiden, a researcher at Wageningen University which is testing the pods, the vehicles will also be equipped with multiple cameras. The cameras are used to map landmarks, which is used as an alternative navigation tool when GPS accuracy is masked by road obstacles like trees. The WEpod can be booked using an app which will allow passengers to reserve a seat and specify their starting points and their destinations. Vehicles are expected to select their itineraries independently. The electric pod was originally designed by French vehicle manufacturer and robotic specialists EasyMile. It was developed for Citymobil2, an EU-funded project looking at automated road transport systems across urban Europe. Although there a lot of science-fictional forebears for the idea of mass transit systems, I was particularly interested in the ability to just step into a randomly selected pod, type in a destination, and let the system take you there. This excerpt about bubble cars is from Larry Niven's 1976 novel A World Out of Time.